We saw a sign on I95 for Aunt Rubys peanuts while heading south. We took the off road adventure to check it out. So glad I did. We bought peanuts and chocolate covered peanuts. Honestly the best peanuts I ever had. We will be ordering regularly from here. The peanuts are grown locally and are addicting they are so good. Have been buying both the country style and the peanuts in the shell for 25 plus years. Have never found any other brands that come close to the freshness and superior taste of Aunt Rubys. 40 oz. tins of the country style and a 5 pound bag of the shelled peanuts are my go to order. Thanks for providing such high quality products and customer service for so many years. These peanuts are delicious. I am so glad I finally stopped here and regret not trying these sooner. I have two tins and am getting ready to place a mail order. So yummy! There is nothing better than Aunt Ruby's peanuts! The most delicious, freshest, large peanuts you will ever it ! We love the country style peanuts. My boss at work bought them for our department and 2 of us bought them for our friends. They are big, crunchy and great! A tin of these peanuts was given to me by a friend from North Carolina over 15 years ago. I thanked her and remembered thinking, oh, peanuts...Planters...hohum. It was truly like a jolt of lightning at first bite! Amazing flavor, aroma, crunch, size! Good grief! And I would tell people about it and they just looked at me blandly wondering what all the fuss was about....until that first taste.... And the revelatory surprised look and subsequent smile! I live for the response!!! Aunt Ruby's Peanuts...A beautiful thing! Someone at work received these as a gift. I was shocked by how good they were! Got these as part of a Christmas basket from my employer one year. They got such rave reviews from all the employees that they remained in the Christmas baskets for years. These are the best peanuts available anywhere! We all love them. No doubt, the best peanuts you can buy. Gourmet is an understatement. These are the crunchiest and largest peanuts I have ever eaten. I purchased a 4-pack for Christmas, with the intention of giving 3 away and keeping 1 for me. Well, I ate 3 and gave 1 away! No need to say, but I will be ordering more. These are the best tasting peanuts I've had--waaaay better than the brands in stores. And the peanuts are much larger too! Didn't know peanuts got that big! I've never been a big salty snack fan...until someone gave me Aunt Ruby's peanuts for a gift. These are the best peanuts I've ever had...huge and so full of flavor...almost "meaty." I can't buy any other brand now. I'm hooked. Plus, have you seen Aunt Ruby's picture? She's so cute! Love all around! Thank you, Aunt Ruby! I have received your peanuts as a gift before. So I purchased them this year for my daughter and she LOVED them! She was so pleased she asked for them for next Christmas. We are NOT gonna wait that long! We received these peanuts as a gift- the best peanuts we have ever tasted! Fresh, crisp, flavorful , phenomenal! Aunt Rubys's Peanuts have totally spoiled me. No other brand can compare! Simply put! These peanuts are the best. Jumbo Fresh Wonderful peanuts like I have never had before - just love them!!!!! Most superb peanuts ever! Extra large,supremely fresh and delicious! Don't doubt it they are the best! Best peanuts I have ever eaten! I love peanuts, and these taste better than any peanuts I have ever eaten! The quality is outstanding! I tried to eat sparingly but found myself going back for more and more until the peanuts were all eaten! I received the peanuts as a birthday gift. They were the best gift I could have received! I hope the recipients of this gift will enjoy the peanuts as much as I have! Co-worker's father gives Aunt Ruby's Country Style Peanuts every year for Christmas and I cannot stop eating them. 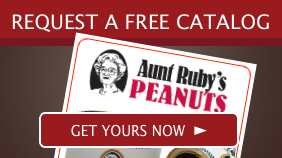 I have never been that excited about a peanut before, but one sample of Aunt Ruby's and you'll be hooked. Crunchy, fresh and perfectly salted. YUM! We bring these as hostess gifts and they are always greatly appreciated. Best peanuts anywhere! A co-worker received a tin as a gift. I almost did not try them thinking this is just 'another tin of peanuts'. DUDE...... this is some serious stuff. I can honestly say I have never tasted better peanuts!!! There Simply Aren't any Better Peanuts! One thing is for sure--when friends are over and we open a can of Aunt Ruby's, we might as well throw away the lid because they will be all gone before the evening is through! We order by the case. The Hands down Best peanuts to be found anywhere!!! They have the best flavor, the best texture and the biggest size. Planters does'nt even come close!! The very best tasting peanuts I have ever eaten. I have ordered them time and time again and found them to be consistent in quality and delicious each time. I do not plan to purchase any other brand, ever again. The Best Peanuts Ever tasted! Your peanuts are the freshed peanuts I've ever tasted! Thanks for such a quality product. My father-in-law was a wise man in many ways and knew a good peanut when he came across one. He introduced me to Aunt Ruby's over 25 years ago, and I've been ordering them by the case ever since. Thanks, AJ. Peanuts that taste as good or better than the peanuts we grew for our own use on my childhood farm. None better. Thanks, "Aunt Ruby". Aunt Ruby's Peanuts are the best you will ever taste. Everyone who eats them in my home wants to know how to get them. I even have friends who stop in Enfield just to buy peanuts. We are used to having friends grab a handful while they're in the midst of a conversation, only to interrupt themselves to say, "These are good! Where did you get them?" Several of those we have given a can as a Christmas gift, now give them as gifts themselves. They're the best. Simply the best. We keep a can in the freezer for a tasty cool and crunchy snack. These are the best country style gourmet peanuts that I have ever tasted!!!!!! I've got a "nut" allergy. Peanuts, not really being a nut, are OK for me to eat. Therefore, I'm quite well versed in peanuts. These peanuts are the best peanuts that I've had anywhere. They maintain a nice crunch with a nice flavor that has just the right amount of salt. Well done Aunt Ruby's and thank you for your dedication. I'm a newly devoted fan. I grew up in northeastern NC on a peanut farm. I have eaten peanuts all my life. I have prepared them many ways and I found that frying them in peanut oil until slightly brown and salting them while hot was the best way. Aunt Ruby's are as good as any I ever prepared. The light coating of salt does no cover up the taste of the nut. Most competitors use too much salt which is bad for taste and your blood pressure. WITHOUT A DOUBT...THERE IS NOT A BETTER PEANUT ANYWHERE IN THE ENTIRE KNOWN WORLD! I CONTINUE TO TELL ALL MY FRIENDS ABOUT THEM SO I HOPE THEY ARE BUYIN' SOME. THANKS FOR THE WONDERFUL PRODUCTS!! these are the best peanuts, always fresh and crunchy. Make great gifts or for gatherings!!!! I was born and reared in Enfield on a large farm where my parents raised peanuts. We used to go to Aunt Ruby's and sample the peanuts. They were so delicious we bought the plain peanuts and chocolate peanuts. 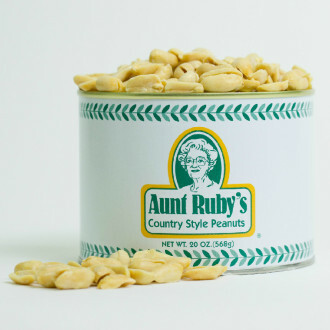 No other peanuts are as delicious as Aunt Ruby's. I now give them as Christmas gifts. Best peanuts in the entire world. we received these peanuts over christmas. at first i just thought another tin of nuts. well, when i open them, the aroma was heavenly. these are the best peanuts i have ever had. so glad the tin needs to be taken off with something other than my fingers, or i would have eaten the entire tin in one sitting. if you are on the fence about these, don't be. order them! my partner brought home after receiving them as a christmas gift. at first we both thought just another can of nuts. well, we opened them, and to our surprise, they are the best peanuts we have ever eaten. they are so fresh, and crunchy, and not greasy. i am putting these on my must haves for my home since we like to entertain. would like to write more but i need to go and have another handful! We have been enjoying Aunt Ruby's Peanuts for over 5 years after discovering them on a trip through North Carolina. These peanuts are outstanding! They are a tremendous value for the size, quality, and most importantly- taste! Each time that we serve Aunt Ruby's products while entertaining a new loyal customer is born! Our friends always ask where they can buy the products. Throughout the year we send Aunt Ruby's peanuts and cashews as gifts to our family and friends. Thank you for incredible service! My Grandpa and his 5 sons sharecropped those fields around Enfield since back before WWII. An Aunt lives around the corner from the plant still. Every time we visit a case always comes back to TN. If I haven't visited before that case empties I'm online. No better PEANUT in the world...and trust me...I love peanuts more than George W. Carver. I am working at a fabulous Newport Rhode Island inn when a guest from Virginia offered me some peanuts. WOW! I just ordered 4 cans. They are the best I have ever tasted! Aunt Ruby's peanut products are the best without a doubt. Wish I could find them in Baltimore! Country style and raw roasted at home are tops. These are the best peanuts you can buy! I have been buying these peanuts online and in the store for over 15 years. I consider myself a common sewer of peanuts (that's a joke) but I have never found one as good as Aun't Rubys, Some close but never as good!!!!!!!! My sister-in-law gave me a box to bring to my office the other day and coworkers love them, they didn't want to step away from the can!Truly the country style peanuts are the best I have ever had. I love these peanuts! They are the best! Keep them in the freezer and they stay fresh! My sister from Florida introduced me to Aunt Ruby's peanuts and suggested we stop at the factory on our way home to Pennsylvania. We did and bought what we thought would be a little 'supply'. Well, they make a wonderful hostess gift and of course they are great to serve your guests. They are the best peanuts you'll ever taste! Enjoy! The Virginian has been silenced. Aunt Ruby's Country Style bested Hubs super salty peanuts according to 3 of every 4 of our colleagues. Thank you Aunt Ruby. We are addicted to these peanuts! We received our first tin as a gift, and have been ordering online ever since. It's hard to describe just how crunchy and delicious these peanuts are. We'll never order any others! I have been ordering Aunt Ruby's Country Style Gourmet Peanuts for many years now and they simply are the best peanuts on the market. I order the large cans by the case every Christmas for gifts and now all my recipients are hooked too. Thank you for such a fine and delicious product! Were given these as a gift for Christmas. Best peanuts I have ever tasted! The Best Peanuts you'll EVER EAT! Like Crunchy? Don't like oily peanuts? Don't like too much salt or too little,but just right? The answer for everyone is Aunt Ruby's Peanuts, they are also #1 grade and HUGE-just order and fall in Love. One peanut and you will never be the same!! I have never, ever tasted a peanut, from a can especially, that was so crisp, and crunchy. They are the best peanuts ever! I am going to order some to send to my Dad in Florida. He will love them! I haven't even looked at everything else you have to offer. Probably the best Peanuts that I've come across..... I even stop at the store on my way to Myrtle Beach! Aunt Ruby's Peanuts are the freshest, crunchiest and best tasting peanuts I have eaten. I have been ordering them online by the case for years. Aunt Ruby's peanuts are the best anywhere. I've tried others and no longer do so. When I want peanuts... I order Aunt Ruby's online, and even stopped by their store once while vacationing.